Ohio’s own Jeg Coughlin Jr. will start Sunday’s Pro Stock eliminations at Norwalk as the top seed. Friday’s scheduled two rounds of Pro Stock time trials were wiped out by inclement weather at Summit Motorsports Park. Forced to run in-between a seemingly endless string of showers, Coughlin and his Rickie Jones-led crew had only one shot at the strip outside Cleveland and capitalized by covering the newly-paved quarter-mile in 6.612-seconds at 208.46 mph. 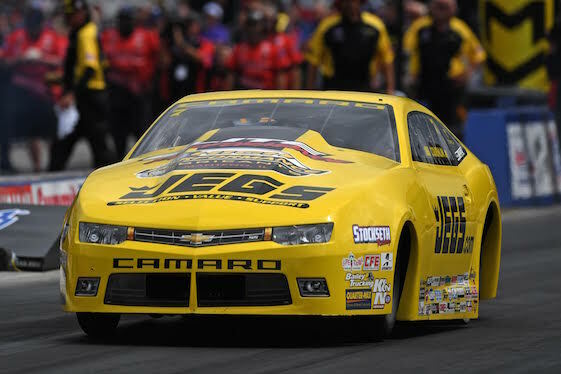 “Our engineers, crew chiefs and crewmen have traversed a lot of different conditions throughout the 2018 season,” said Coughlin, driver of the JEGS.com/Elite Performance Chevrolet Camaro SS. “Certainly, coming here to a freshly-poured track we would have liked to have been down it a couple more times but the Baders (track-owner Bill Bader Jr. and family) did a great job. The surface is smooth and the rubber is going to continue to get better and better as the weekend continues. Clay Millican (Top Fuel), Courtney Force (Funny Car) and Matt Smith (Pro Stock Motorcycle) also emerged as No. 1 qualifiers in their respective categories at the 12th of 24 events on the 2018 NHRA Mello Yello Drag Racing Series schedule. As No. 1 qualifier, Coughlin will open eliminations Sunday against part-timer Charlie Westcott, a longtime friend from Parma, Mich. Westcott’s qualifying time was 6.963-seconds at 200.80 mph. Coughlin is working on a three-race win streak that started in Joliet, Ill., near Chicago, with a victory in Pro Stock. He then won in Super Comp in Dinwiddie, Va., before returning to the Pro Stock victory circle last Sunday in Bristol, Tenn.
“We made some changes within the camp a handful of races ago that are working out very well,” said Coughlin, a five-time “Factory Hot Rod” world champion. “We changed the chassis and it was like a light switch as far as the car being more predictable. The first three or four races we knew we had a fast race car and things were turning our way. Then we got to Chicago and everything finally fell into place. “This group has stayed together, weathered some storms and it feels really nice to see the recent rewards. I’ve been fortunate enough to this point to win 79 national events in my career and I can honestly say Chicago felt like one of my first-ever wins because of how special it was with the team that I’m with. It was our first win together and everybody was as excited as I was. Then, to transition a couple of races later and get another win on Father’s Day was special as well. Jason Line qualified second and will go head-to-head with veteran Kenny Delco in eliminations. Line, of Ken Black Racing, earned P2 based on a 6.621-second pass at 208.78 mph in his blue Summit Racing Equipment Camaro SS. Millican set the Top Fuel track speed record Saturday during his single round of qualifying, covering the 1,000-foot distance in 3.750-seconds at 332.67 mph. Millican, whose car is tuned by David Grubnic, posted his sixth No. 1 qualifier of the season in search of his fourth career victory. Millican will square-off against Dom Lagana in the first round. Reigning Top Fuel world champion Brittany Force qualified second and will face Terry McMillen in Round 1. Sister Courtney Force remained atop the Funny Car field with a 1,000-foot pass of 3.935-seconds at 327.66 mph in her Advance Auto Parts Camaro SS recorded during the lone qualifying run on Friday. The current point-leader secured her eighth No. 1 qualifier of the year. “I feel like my crew chiefs have pretty well figured it out this season,” said Courtney, referring to Brian Corradi and Dan Hood of John Force Racing. “I’m just really excited to be driving this Funny Car. Having that one good run helps you feel a lot better and confident going into race day.” She will race John Smith in the first round. Ron Capps, the 2016 world champion from Don Schumacher Racing, qualified second in his Dodge Charger R/T and will race Jeff Diehl ‘s Toyota Camry on Sunday. Meanwhile, two-time world champion Cruz Pedregon failed to crack the 16-car field. Smith used a quarter-mile pass of 6.866-seconds at 195.39 mph aboard his Victory Magnum from Friday to lead the Pro Stock Motorcycle pack Saturday. Smith will open against Jim Underdahl and his Suzuki. Hector Arana Jr. qualified second and will race Ryan Oehler in the first round. Eliminations are scheduled to begin at 11 a.m. (EDT) on Sunday, weather permitting. Saturday’s qualifying will be aired Sunday on FOX Sports 1 during a two-hour time block including “NHRA Sunday Live,” while Sunday’s eliminations will be shown on FS1 beginning at 6:30 p.m.
Top Fuel _ 1. Clay Millican, 3.750-seconds, 332.67 mph vs. 16. Dom Lagana, 5.039, 140.69; 2.Brittany Force, 3.770, 328.94 vs. 15. Terry McMillen, 4.383, 224.88; 3. Steve Torrence, 3.786, 328.62 vs. 14. Chris Karamesines, 4.096, 295.98; 4. Tony Schumacher, 3.792, 330.63 vs. 13. Kyle Wurtzel, 4.037, 250.69; 5. Antron Brown, 3.805, 327.27 vs. 12. Blake Alexander, 3.983, 306.46; 6.Mike Salinas, 3.818, 313.07 vs. 11. Luigi Novelli, 3.974, 292.65; 7. Pat Dakin, 3.833, 328.86 vs.10. Richie Crampton, 3.888, 316.60; 8. Leah Pritchett, 3.838, 324.98 vs. 9. Doug Kalitta, 3.844, 320.74. Did Not Qualify _ 17. Scott Palmer, 5.484, 125.11; 18. Audrey Worm, 12.635, 56.10. Funny Car _ 1. Courtney Force, Chevy Camaro, 3.935, 327.66 vs. 16. John Smith, Toyota Camry, 4.302, 277.66; 2. Ron Capps, Dodge Charger, 3.961, 322.65 vs. 15. Jeff Diehl, Camry, 4.258, 304.67; 3. Matt Hagan, Charger, 3.981, 325.22 vs. 14. Tommy Johnson Jr., Charger, 4.209, 245.81; 4. John Force, Camaro, 3.991, 325.22 vs. 13. Jim Campbell, Charger, 4.198, 298.21; 5. Robert Hight, Camaro, 4.017, 322.27 vs. 12. Dale Creasy Jr., Dodge Stratus, 4.143, 313.95; 6. Tim Wilkerson, Ford Mustang, 4.032, 314.61 vs. 11. Jack Beckman, Charger, 4.101, 308.57; 7. J.R. Todd, Camry, 4.044, 315.27 vs. 10. Bob Tasca III, Mustang, 4.065, 318.92; 8. Shawn Langdon, Camry, 4.050, 308.71 vs. 9. Del Worsham, Camry, 4.056, 312.57. Did Not Qualify _ 17. Cruz Pedregon, 4.302, 211.86; 18. Jonnie Lindberg, 5.381, 153.67. Pro Stock _ 1. Jeg Coughlin Jr., Chevy Camaro, 6.612, 208.46 vs. 16. Charlie Westcott Jr., Ford Mustang, 6.963, 200.80; 2. Jason Line, Camaro, 6.621, 208.78 vs. 15. Kenny Delco, Camaro, 6.951, 205.98; 3. Matt Hartford, Camaro, 6.622, 207.75 vs. 14. Wally Stroupe, Camaro, 6.840, 202.97; 4.Bo Butner, Camaro, 6.630, 207.72 vs. 13. John Gaydosh Jr., Camaro, 6.780, 204.88; 5.Vincent Nobile, Camaro, 6.632, 207.46 vs. 12. Deric Kramer, Camaro, 6.647, 208.04; 6. Tanner Gray, Camaro, 6.635, 208.39 vs. 11. Chris McGaha, Camaro, 6.646, 208.78; 7. Greg Anderson, Camaro, 6.638, 208.55 vs. 10. Drew Skillman, Camaro, 6.645, 207.27; 8. Alex Laughlin, Camaro, 6.641,207.75 vs. 9. Erica Enders, Camaro, 6.643, 208.39. Pro Stock Motorcycle _1. Matt Smith, Victory, 6.866, 195.39 vs. 16. Jim Underdahl, Suzuki, 7.020, 190.94; 2. Hector Arana Jr., Buell, 6.872, 196.85 vs. 15. Ryan Oehler, Buell, 7.017, 191.35; 3. Angelle Sampey, Buell, 6.899, 193.24 vs. 14. Joey Gladstone, Suzuki, 7.008, 189.71; 4. Andrew Hines, Harley-Davidson, 6.911, 194.58 vs. 13. Scotty Pollacheck, Suzuki, 6.976, 191.51; 5. Jerry Savoie, Suzuki, 6.911, 195.39 vs. 12. Hector Arana, Buell, 6.975, 195.70; 6. Eddie Krawiec, Harley-Davidson, 6.915, 195.14 vs. 11. Cory Reed, Buell, 6.954, 193.85; 7. LE Tonglet, Suzuki, 6.925, 194.80 vs. 10. Mark Paquette, Buell, 6.940, 192.55; 8. Steve Johnson, Suzuki, 6.929, 190.92 vs. 9. Angie Smith, Buell, 6.938, 194.66. Did Not Qualify _ 17. Marc Ingwersen, 7.043, 190.19; 18. Kelly Clontz, 7.064, 191.32; 19. Ron Tornow, 7.158, 188.75; 20. Karen Stoffer, 7.304, 172.10. Rick Hord retained pole position for the E3 Spark Plugs NHRA Pro Mod Drag Racing Series portion of the Summit Racing Equipment NHRA Nationals following the second session of time trials. Teams only recorded one qualifying session due to inclement weather. This weekend’s Pro Mod racing, presented by J&A Service, is the seventh of 12 events this season. Hord will face Troy Coughlin Sr. on Sunday morning. Coughlin, brother of Pro Stock pole-sitter Jeg Coughlin Jr., qualified his JEGS.com twin-turbo Ford Mustang at 5.866-seconds and 251.77 mph. Mike Castellana qualified second and will race Danny Rowe during the first round, scheduled to begin at approximately 9:15 a.m. Sunday. Pro Modified _ 1. Rick Hord, Chevy Corvette, 5.754, 254.76 vs. 16. Troy Coughlin, Ford Mustang, 5.866, 252.14; 2. Mike Castellana, Chevy Camaro, 5.766, 252.14 vs. 15. Danny Rowe, Camaro, 5.859, 249.58; 3. Jose Gonzalez, Camaro, 5.772, 254.28 vs. 14. Pete Farber, Dodge Daytona, 5.851, 243.72; 4. Rickie Smith, Camaro, 5.790, 249.16 vs. 13. Dan Stevenson, Camaro, 5.837, 253.04; 5. Mike Janis, Camaro, 5.793, 246.53 vs. 12. Khalid alBalooshi, Camaro, 5.827, 248.07; 6. Steven Whiteley, Camaro, 5.795, 251.49 vs. 11. Todd Tutterow, Camaro, 5.824, 245.90; 7. Eric Dillard, Pontiac Firebird, 5.799, 254.38 vs. 10. Jeremy Ray, Corvette, 5.819, 246.08; 8. Chad Green, Camaro, 5.812, 245.14 vs. 9. Harry Hruska, Camaro, 5.818, 250.55. Did Not Qualify _ 17. Steve Jackson, 5.867, 245.72; 18. Jeffery Barker, 5.882, 253.09; 19. Steve Matusek, 5.886, 247.43; 20. Jim Whiteley, 5.891, 244.96; 21. Erica Enders, 5.904, 250.04; 22.Brandon Snider, 5.915, 243.33; 23. Eric Latino, 5.916, 247.34; 24. Doug Winters, 6.015, 241.37; 25. Chuck Little, 6.085, 241.37; 26. Clint Satterfield, 6.103, 243.85; 27. Bob Rahaim, 6.939, 141.73; 28. Sidnei Frigo, 8.411, 110.13; 29. Chip King, 10.166, 88.20.